The Australian teen who gained the name "Egg Boy" after infamously egging Queensland senator Fraser Anning says he is embarrassed by the amount of attention his action gained. 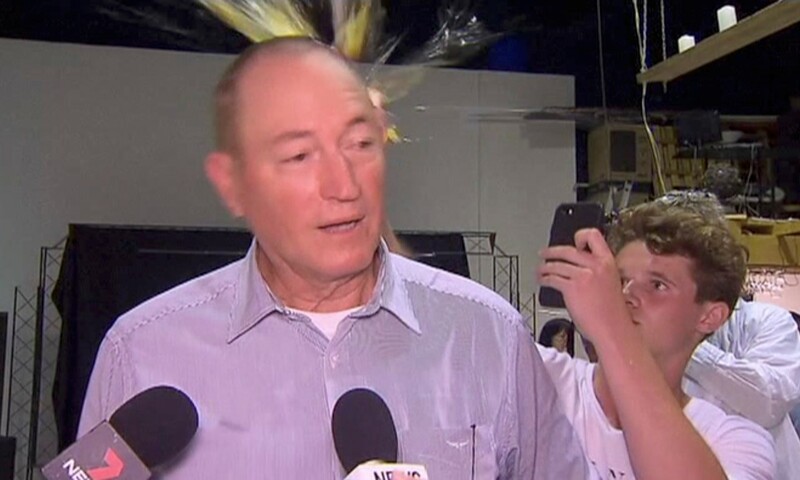 Will Connolly from Hampton, Melbourne, became an internet sensation after cracking an egg on Anning's head after the politician made comments blaming Muslim immigration rules for the Christchurch terror attack. Speaking publicly about the act for the first time, Connolly told The Project Australia what prompted him to do it. "I read a statement and then I saw the senator and I thought it was disgraceful." But he knew it was not the right thing to do. He also hadn't expect the huge publicity around it, nor had he expected Anning to retaliate. "I didn't think this was going to blow up. In fact it's blown up completely out of proportion to the point where it is kind of embarrassing because too much attention has been brought away from the real victims suffering. We should be focusing on them. "But I was just going to show my mates - it was meant to be a few laughs with some mates." Within hours of egging the senator Connolly's face was plastered on T-shirts being sold across the world and a GoFundMe page was set up to raise money for his legal fees. He was offered free lifetime tickets by some musicians to any of their shows, and US band Wheatus labelled him "Hero of The Earth" and fans suggested the band re-record their song Teenage Dirtbag as Teenage Eggboy. Connolly also this evening tweeted that he was launching a fundraiser for the Christchurch mosque attack victims. "Friends and all my well wishers. In few hours launching my first OFFICIAL fundraiser, please be connected, generous and help me spread the word #eggboy #NewZealand," he tweeted. The tweet was made less than an hour before The Project Australia aired an interview with him.